Outstanding Beethoven playing here - my favourite op 133, maybe. I was mostly interested in Zorn's piece (stylistically more conventional in line with the tradition of Schoenberg) and Saunders's (intense, like typical avant-garde piece), but I also greatly enjoyed the works of the composers I had not heard of before. Mason's piece contains diverse musical elements, fun to listen to. Bedford's piece is beautiful and most accessible. I was a little surprised to hear Arditti Quartet playing such romantic melodies. Ah, my beloved Arditti Thread! So, this is their new offering? (sigh) Sure, it looks interesting- but I've been quite chilly towards their releases of... wow, the past many years now... besides those 2nd Cycles (Dusapin, Harvey, Ferneyhough, Lachenmann), none of the ... err... younger generation's names strike any interest in me at all. AND- most of those recital CDs only have one SQ, with other chamber pieces, rather than a disc devoted wholly to SQs. I heard that on Qobuz when it came out. I think Benedict Mason's piece was my favourite actually—I have his 1st string quartet (also played by the Ardittis, in an earlier incarnation) on a cd. Also, Sarah Maria Sun is insanely good. Zorn after 1990ish is not my cuppa, but damn. The first time I heard Xenakis- HATED IT!! I liked most of Arditti Quartet albums, but Pintscher and Cerha did not leave strong impressions. Maybe re-listening is needed. I have not heard Hosokawa's works they recorded recently. 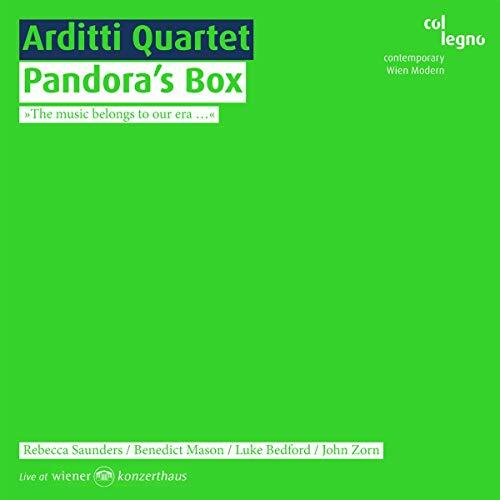 I think the compositions in that Pandora's Box album are a little different from Arditti Quartet's typical repertory (modernism, complexity, abstract), and John Zorn is not a composer I usually associate with Arditti Quartet. I wonder if the group is going to change the direction or widening its range ... ? I know only very few composers in their 30s. I think Dai Fujikura's Flare is very good but yes it's just one SQ in the album. The Ferneyhough set is very good. That and Xenaxis are my favorite Arditti Quartet albums. I like their recordings of Cage's quartet a lot (and not SQ but Freeman Etude by Arditti, too.) Carter, Berg, Nono are all excellent. Schoenberg albums are no longer available? I regret I didn't purchase many of Montaigne discs when they were easily available. One I like is their Lachenmann, mainly for Grido. And the Maderna for the quartet in two tempos. I got Pulse Shadows very recently and feel very positive. I believe Arditti made an LP of some of the Ferneyhough quartets which never got transferred to CD. Is that right? One I really want to hear is the Schoenberg late trio - can someone upload it for me? It's hard to find. The Arditti have lost me. I just don't see anything recent of interest. They have really plunged into "New Composers", for which I have absolutely no interest. Zayín (1983-1997), by Francisco Guerrero Marín (1951-1997). Video recording of the world premiere in Seville (Spain) by the Arditti Quartet on February 8, 1997. Now listening to the Maderna's Quartetto per archi in due tempi. Indeed, a wonderful album. I bought a (used) physical copy a couple of months ago—I had been looking for it for quite a while—and really enjoyed it. The recording of the Maderna is AFAIK the same as that contained in the Arditti’s “Bruno Maderna for strings” CD, but other pieces (the Bussotti, Berio’s first SQ, etc.) were new to me and very interesting. Yes, wonderful album indeed. A couple of composers - Scodanibbio and Melchiorre - simply unknown to me. Scodanibbio in particular seems to be very interesting and worth deserving an in-depth research. 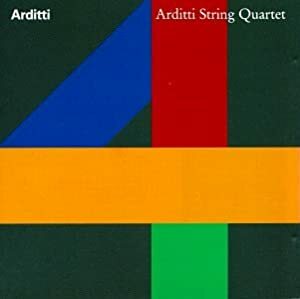 Just wondering where are the other albums of the series (Arditti quartet edition). This is no.24-25, but what about the rest? You’ll see quite a few (but I think not all) in this link: discogs Arditti Quartet Edition. I have “Cinq Quatuors Espagnols”, “From Vienna”, the Maderna, both Nono releases and the set with Schoenberg’s SQs in my collection (plus the recently purchased “From Italy” album). 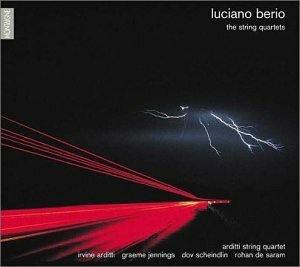 I know Berio’s First SQ (from the album we’ve been discussing) and the third, “Notturno” (with the Alban Berg Quartett), but not the other two pieces es on this disc. BTW thank you for the link, I'd have hoped for a more homogeneous edition and, anyway, I believe most (if not all) of them are OOP. Now listening to their rendition of Sciarrino's Sei quartetti brevi. Much more incisive than the Quartetto Prometeo's (Kairos), the only other performance I know.